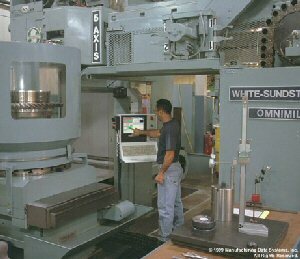 At the Turbine Engine Components Technologies (TECT, Utica Corporation) aerospace plant in Santa Fe Springs, California, manufacturing manager Ron Patlian installed OpenCNC® on two rebuilt Sundstrand Omnimilsand increased manufacturing capacity without spending from $500,000 to $2 million each for new machine tools. "We gave OpenCNC a try and it delivered smooth continuous five-axis motion from the very start," Patlian said. "We do some very critical fiveaxis contouring and our machines need to perform right at the peak. MDSI delivered the servo control that worked. "Even completely retrofitting all the electronics, we saved money," he said. "The result is equipment that provides added capacity for a quarter of the new cost, reducing the cost of capitalization and improving stockholders' return on investment." TECT is an independent job shop for productioncritical, gas turbine engine and airframe components. Jobs include manufacturing centrifugal compressor parts for helicopter engines, locomotive turbocharger compressor wheels, and parts for commercial airplanes and jet attack fighters. For more information about the TECT installation, read "Multi-axis CNC Machining Made Easy."